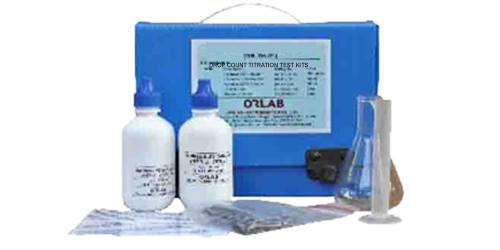 Total or M-Alkalinity Test Kit - Orlab Instruments Pvt. Ltd.
Procedure: Small amount of sample is collected in a test tube and an indicator reagent is added to the sample. Use the dropper bottle, the titrant, until the color changes. To calculate the concentration just multiply the number of drops required by the titrant by a simple factor given in the test kit manual. The sample is titrated with Sufuric acid to a colorimetric end point corresponding to a specific pH. Total Alkalinity is determined by titration to a pH of 4.5 by using mixed Bromocresol Green Methyl Red indicator. pK/100 tablets Alkalinity indicator, 100 ml of Alkalinity reagent, 10 ml measuring cylinder,100 ml conical flask, instruction manual in a flute board box.